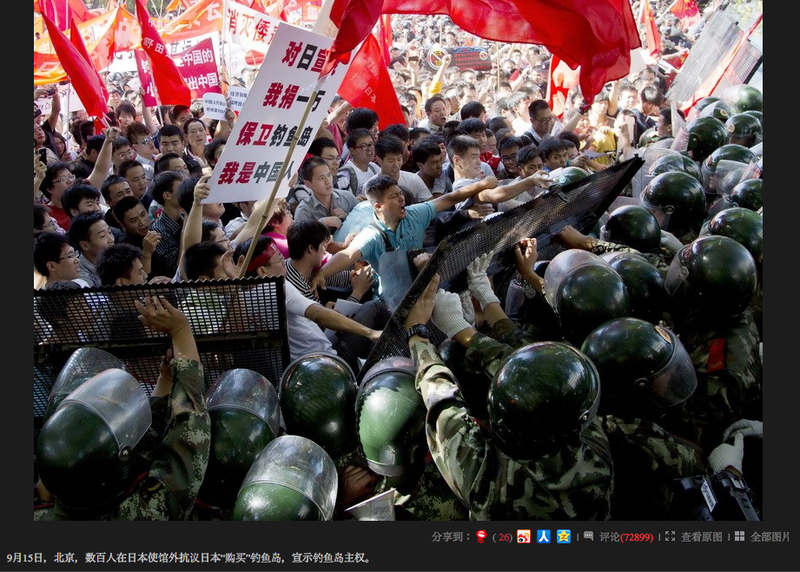 Scene of the attack on father of two Li Jianli during anti-Japanese protests in Xi’an, September 15, 2012. 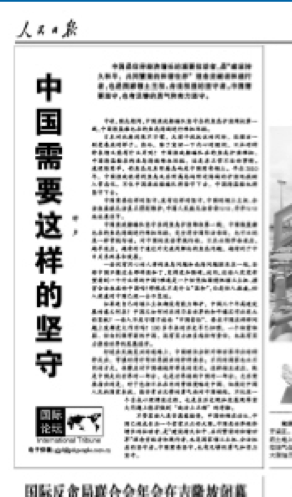 Mr Li’s wife, Mrs Wang, featured in the story translated below, is seen cradling her husband’s head. First came the exhortations to “rational patriotism“, accompanied by satisfying news of China’s government’s “strong countermeasures” — how many law–enforcement ships, how many Chinese fishermen heading to Diaoyu, how surprised Noda was at the strength of China’s response, and even a belated appearance by the PLA Navy in the area. 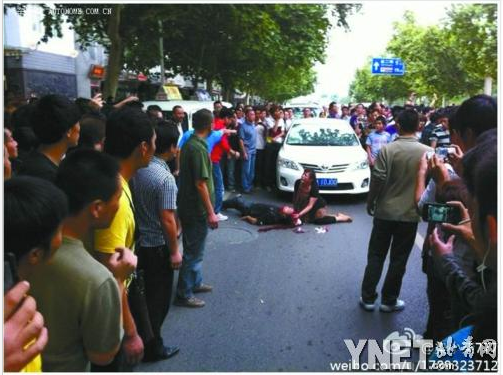 Yesterday the Beijing Youth Daily published a detailed, vivid and gory account of how Li Jianli, a Xi’an family man, was left with brain damage just for driving a Toyota Corolla in Xi’an. 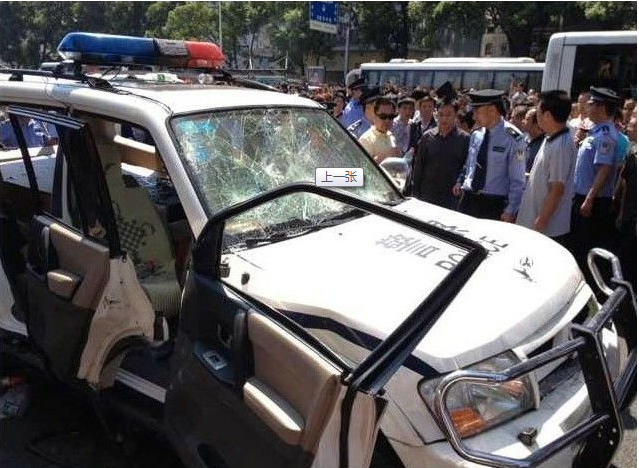 As the article describes, Li’s wife got out and tried to convince the protesters not to smash the car with a few “good sentences”, including a pledge to never again buy a Japanese car, but this was all to no avail as someone smashed his skull with a D-lock. Perhaps to avoid demonizing the protesters, or maybe to provide a positive exemplar (after all, what politicised human interest story would be complete without one of those? ), the piece concentrates on the intersection of Li Jianli’s tragic tale with that of a protest-planner-turned-saviour, 31-year-old tool peddler Han Pangguang. When Han heard about Japan’s plan to nationalise the Diaoyus he collected several hundred signatures from other sellers in the marketplace and applied to hold a protest. But as soon as he heard that the protests had turned violent, according to the article, he suddenly turned his attention to saving those threatened by the violence. 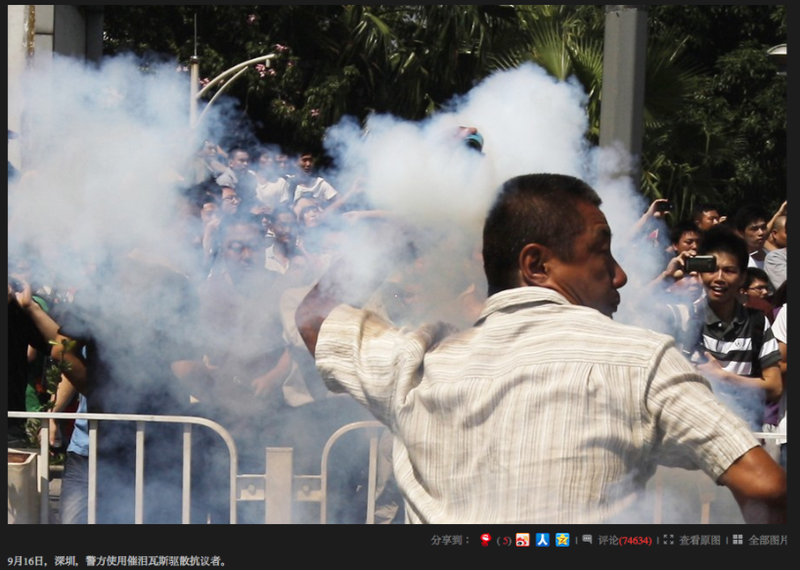 The injection of Han Chongguang into the story, of course, serves to support the official line that it was not protesters, or anti-Japanese sentiment, that was the problem, but rather, illegal elements who hijacked the protests. 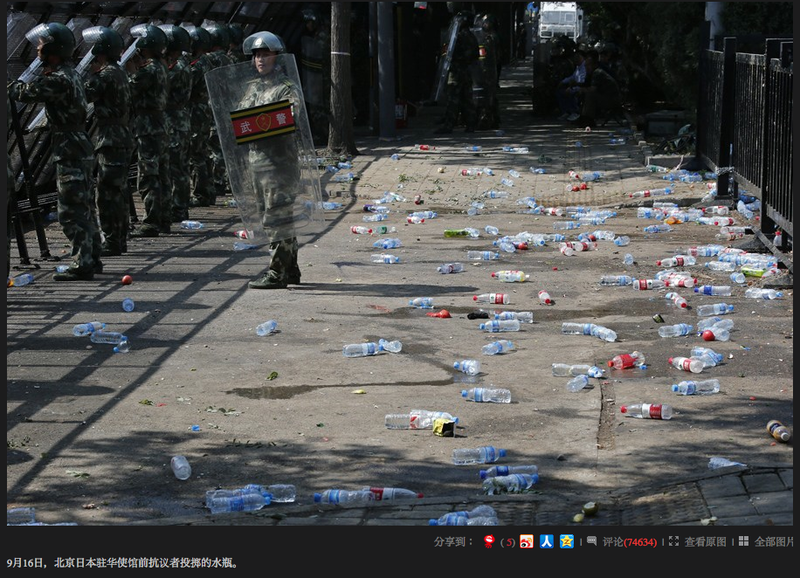 Nonetheless, the piece provides a fascinating first-hand accounts of the chaos of September 15 in Xi’an. Fifty-one-year-old Xi’an resident Li Jianli was the breadwinner for his family, but now he lies rigid in a hospital neurosurgery ward. Li Jianli’s left arm and leg have begun to regain partial movement, but the whole of the right side of his body remains limp. He can slowly bend his right leg, but his right arm and hand just flatly refuse to obey orders. His speech faculties have been badly damaged; he can only say simple 1-2 syllable phrases like “thanks” and “hungry”. 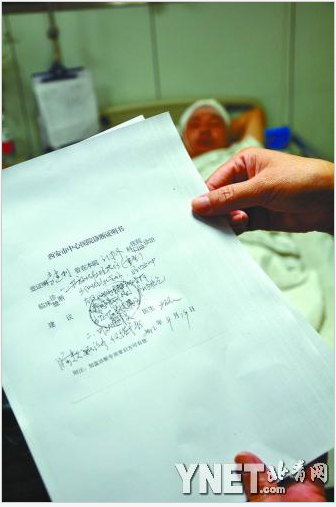 Xi’an Central Hospital has made a diagnosis: open craniocerebral injury (heavy). Luckily, over the past three days in intensive care he has basically returned to consciousness. As soon as he thinks of what happened to him on September 15, his eyes turn red and silent tears begin to flow. His left hand struggles up to wipe them away. At 3.30pm that day he was smashed on the head with a U-shaped lock, which penetrated the left side of the top of his head, shattering his skull. He fell down, unconscious, and thick blood and cranial matter spilled out onto the ground. Soon, bloody foam was coming out of his mouth. 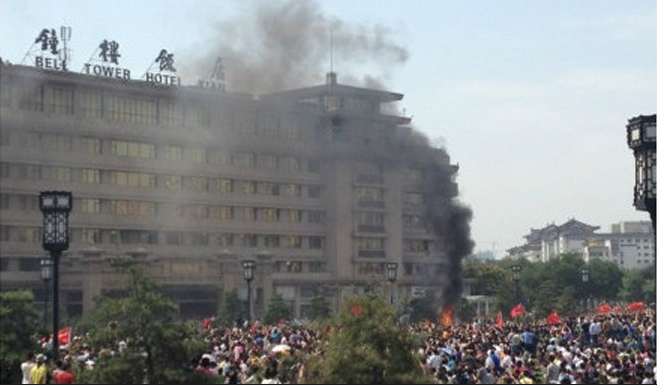 Last night i tweeted, ill-advisedly, that since the official media remain in saturation-coverage mode over Diaoyu, i thought the protests would continue today. I quickly found i was emphatically wrong. 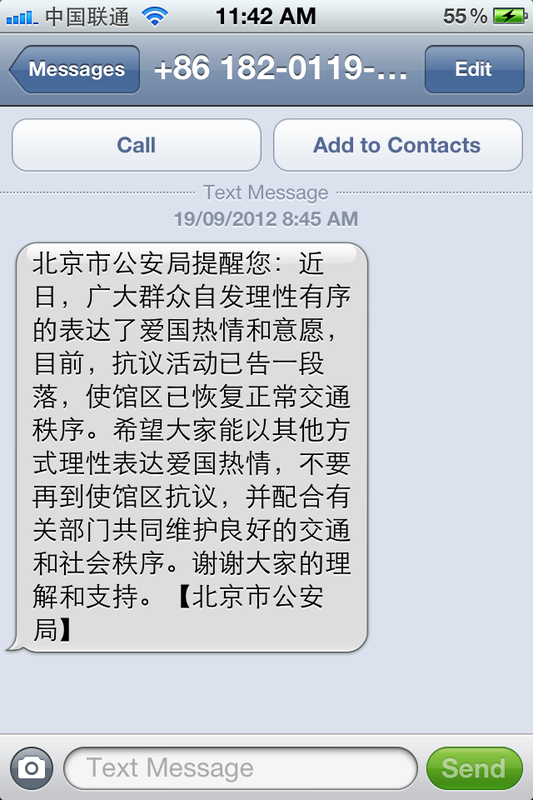 I knew my hunch was mistaken even before i arrived at the embassy area this morning. 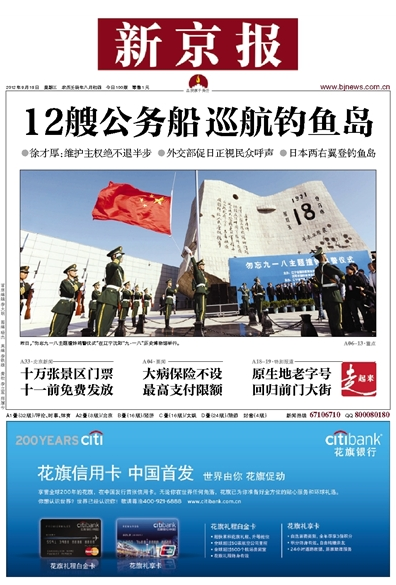 A glance over some of the newspapers suggested a qualitative shift in the coverage, which i had missed last night: while the quantity of Diaoyu news remains overwhelming, the emphasis is now on good news much more than the ghastly deeds of the Japanese. 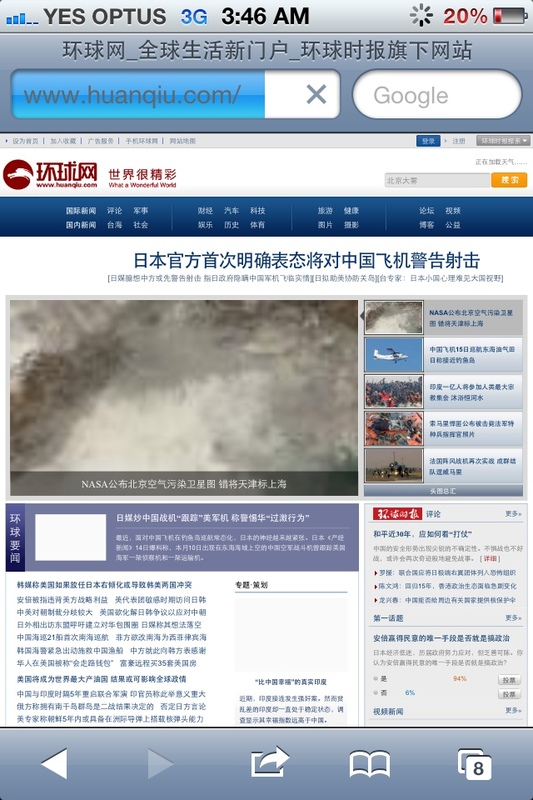 The Beijing News (pictured above), for example, led with “12 [Chinese] official boats patrolling at Diaoyu“, and put the “Two Japanese right-wingers, falsely claiming to be fishing, land on Diaoyu” on page 8. 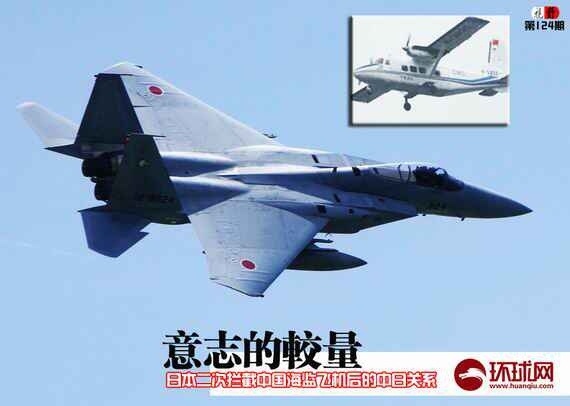 Likewise, the Huanqiu Shibao had “12 Chinese boats approach Diaoyu” (image not available online at present) , and i have failed to find the Japanese landing story anywhere in the paper. 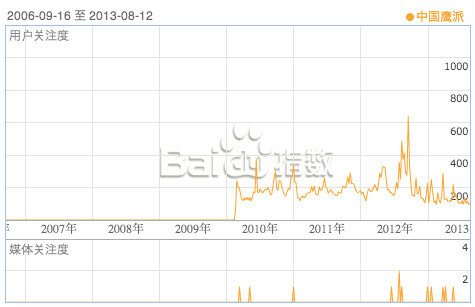 This pattern echoed precisely what happened in the online news sector yesterday. The Japanese right-wing landing was a dominant headline (ie. 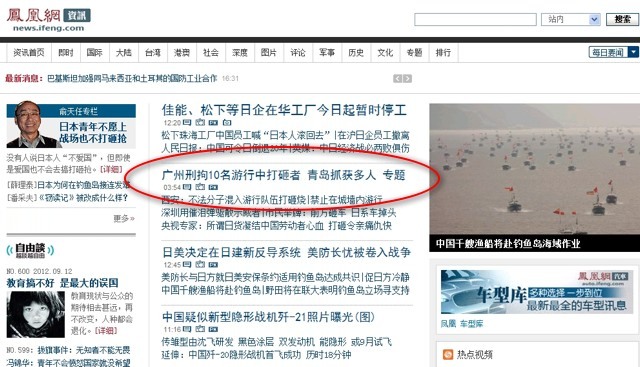 large-font at the top) on all of the top five PRC news portals as at 4.30 yesterday afternoon — understandable given the story’s sensationally provocative nature as summed up in the text of the headlines, which all slapped the move with the “serious provocation” tag. But by 8.30pm the story had been relegated to the sub-dominant headlines (ie. 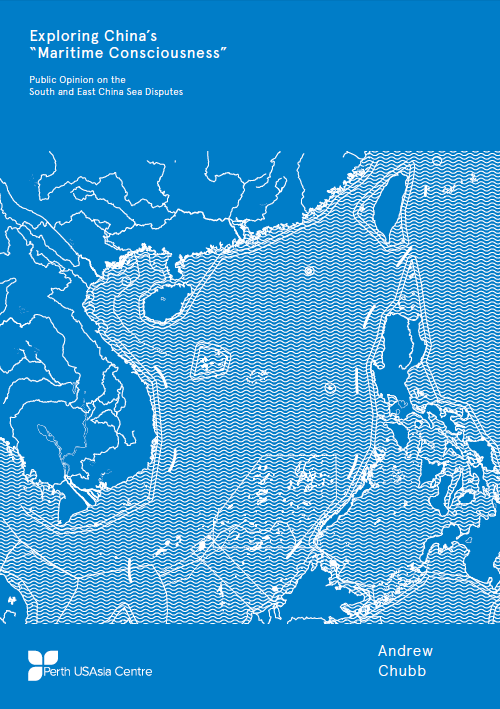 small-font, still at the top) in favour of the presence of China’s government ships patrolling in Diaoyu waters, which at that point numbered eleven (it’s now up to 14). 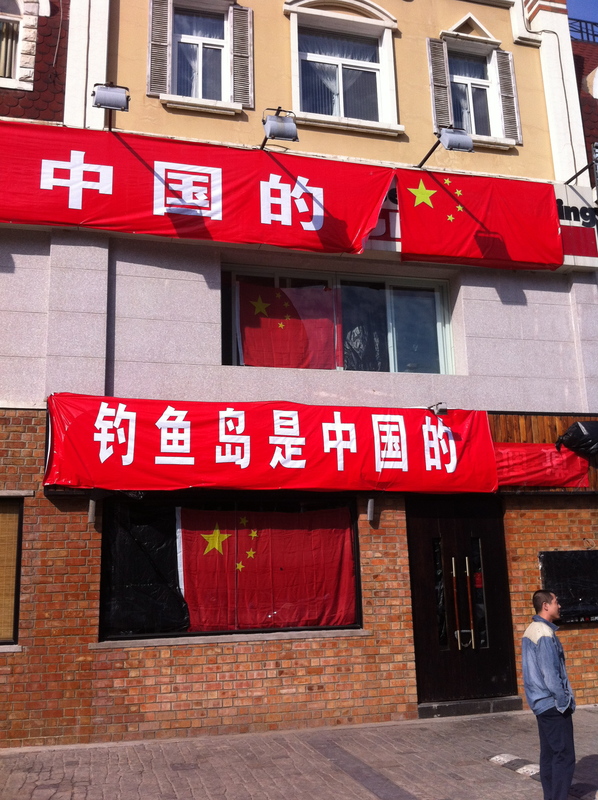 Beijing Municipal Public Security Bureau alerts you: In recent days the broad masses have expressed their patriotic enthusiasm and wishes spontaneously, rationally and in an orderly way. 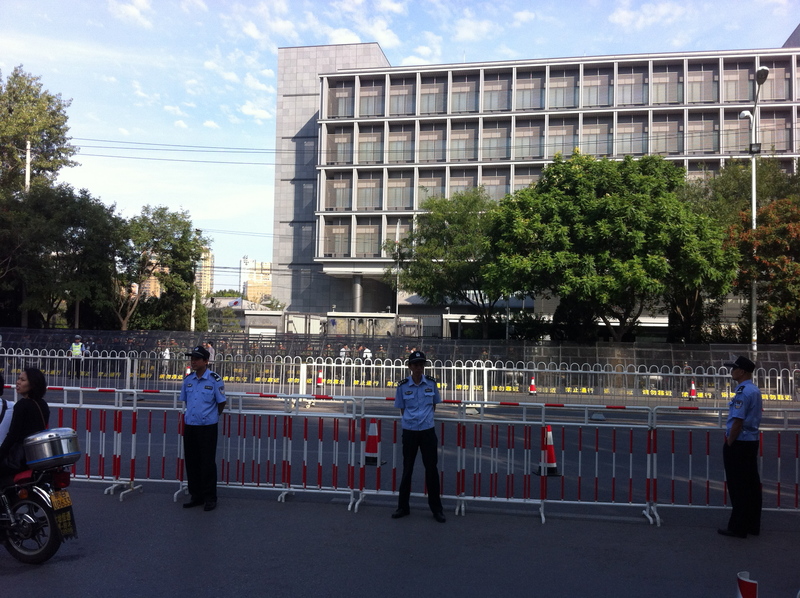 Protest activities have now concluded, and the embassy area has returned to normal traffic conditions. It is hoped that everyone will express patriotic enthusiasm in other ways, will not come again to the embassy area to protest, and will cooperate with relevant authorities to jointly uphold good traffic and social order. 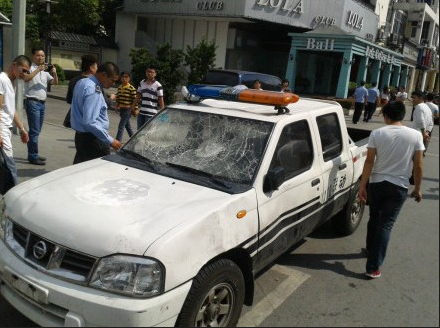 Thankyou everyone for your understanding and support — Beijing City Public Security Bureau. It doesn’t get any clearer than this. The protests were acceptable, indeed laudable, to the authorities until today. Now they are banned. Sure enough, when we reached the street corner i had to check the road sign to know whether i was in the same place as i had been the past few days. It was full of fast(ish)-moving traffic, and there was not a single five-starred red flag in sight. 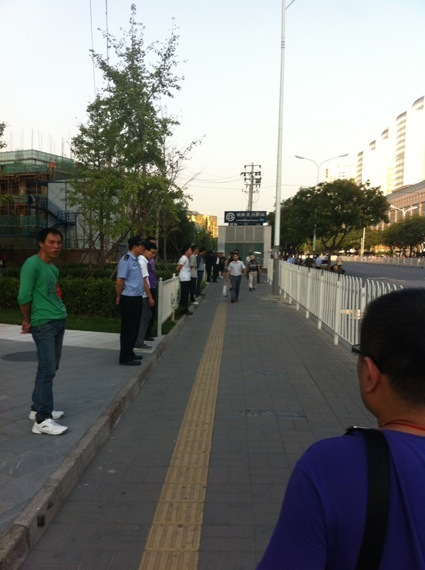 We walked up towards the embassy, and quickly encountered a marching column of about 100 police. Beyond, individual police officers were stationed approximately 3 metres apart for the next 800 metres or so.The People’s Armed Police and barricades in front of the Japanese embassy remained, and in the carpark of the International Youth University opposite the embassy we found busloads of PSB officers waiting in reserve. All up, there appeared to be approximately as many police as there had been over the previous days of thousands-strong protests. That is to say, there were probably less plain-clothes officers and roughly the same number of uniformed ones, whose function had changed from facilitation and crowd control to prevention of any sign of protest whatsoever. In 45 minutes of wandering up and down, in and out, literally the only Chinese flags i saw were those covering up the signs on the Japanese restaurants. To (hopefully, temporarily at least) end this dark chapter on a happier note, check out this 特牛 bagpipe-player, kilt and all, filmed during the massive demonstrations yesterday. William Wallace’s military spirit, or a fiercely patriotic Chinese Scot — who knows? Also the police presence.